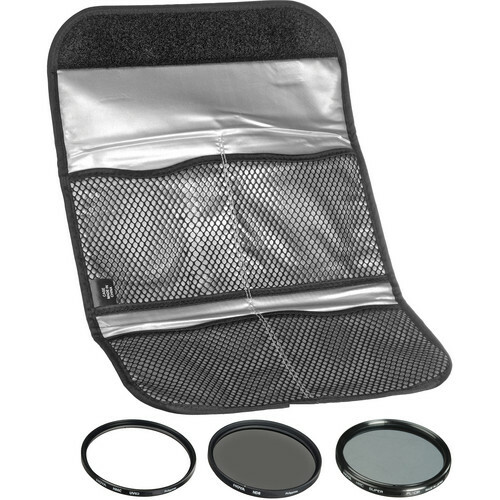 The Hoya 37mm Digital Filter Mark II Kit contains a UV (C) HMC filter, circular polarising filter, and a 3-stop neutral density filter in a handy filter pouch which is the perfect set to enhance your pictures. 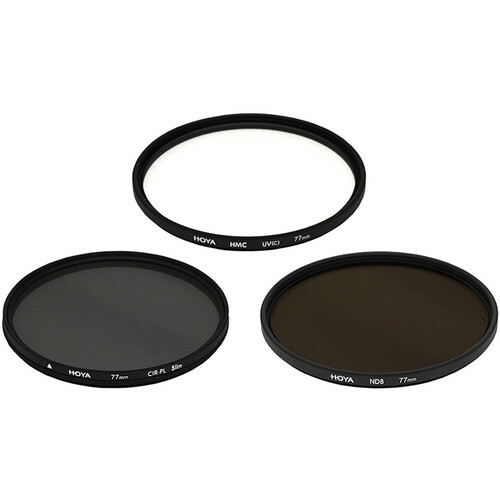 The UV (C) filter is a multi coated filter with a slim mounting ring. This makes it useful for wide-angle lenses to avoid vignetting. Also, the UV filter itself is a clear filter that helps to absorb ultraviolet light. No additional contrast is provided, allowing you to pair this filter with other filters. It is also useful as a general protective filter to leave on lenses at all times. Filters help to reduce dust moisture and protect you lense from drops and in situations where scratching could occur. 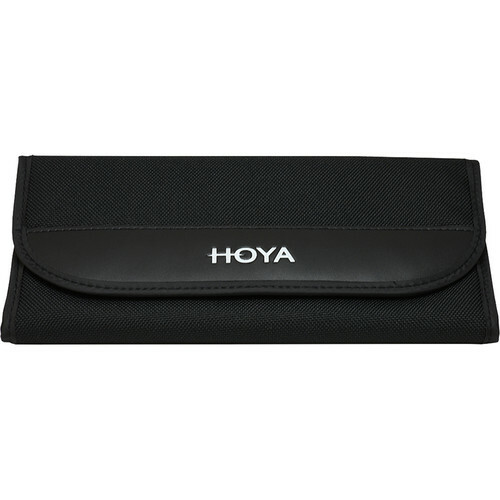 Hoya HMC filters are multi coated for reduction of reflections and flare on the filter surface. As a result, over 97% light transmission is possible, providing you with additional contrast and high colour devotion. HMC multi-coating helps to reduce glare and reflections on the filter surface for greater contrast. The polarised light is reduced by the help of this HMC circular polarising filter, this helps in reduction of reflections and glare. The sunlight is naturally partially polarised due to the reflection of its rays with the air molecules causing the light to scatter and become appear as haze. This directionally polarised light is filtered perpendicularly to the reflected light, allowing for the absorption of much of this light. This results in a noticeable reduction of glare and reflections and an increase in the saturation of skies. This filter arranges, and filters, this directionally polarised light perpendicularly to the reflected light, allowing for the absorption of much of this light. This results in a noticeable reduction of glare and reflections from non-metallic surfaces and an increase in the saturation of skies and scenery by clearing haze. Strongest effects are observed when this filter is used at a 90° angle from the sun. This filter is used instead of linear polarising filter with digital cameras auto focus features. The best results are achieved by the use of neutral density filter. ND filters reduce the amount of light reaching the lens, allowing the user to utilise wider apertures/slower shutter speeds. They have no effect on colour balance. The filter factor of this filter is 0.9, equivalent to 3 stops of light. It helps to enable slow shutter speeds to be used. With high speed films, to record movements such as waterfalls, clouds, or cars. It is also useful for fixed shutter speed cameras to film overexposed objects such as sand, snow or any other bright scene. The ND filter also helps in decreasing the depth of field by allowing the camera it to be used outdoors in bright situations by decreasing the ISO high speed film effect eg more than 400 IOS. 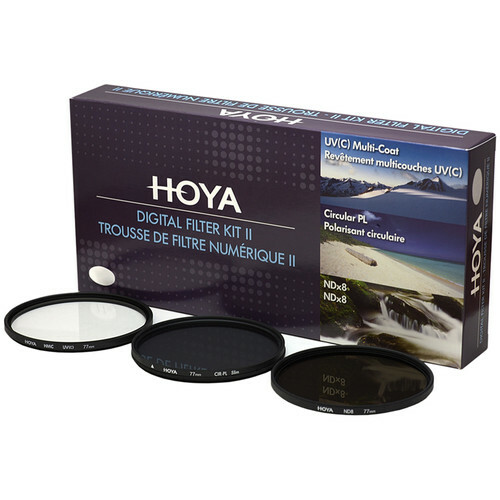 For more information about, Hoya 37mm Digital Filter Kit Mark II website.